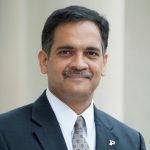 Dr. Suresh Garimella is the R. Eugene and Susie E. Goodson Distinguished Professor in the School of Mechanical Engineering at Purdue University, and Director of the Cooling Technologies Research Center (CTRC), an Industry/University Cooperative Research Center of the National Science Foundation. He currently serves as Executive Vice President for Research and Partnerships for Purdue University. His prior administrative appointments include service as Purdue’s Chief Global Affairs Officer, and earlier as Associate Vice President leading the Office of Engagement.